40094 Snowplough is the January 2014 Monthly Mini Model Build. 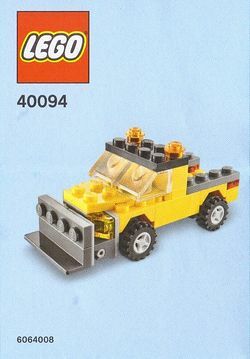 The set consists of a small yellow pickup truck with a grey snowplough at the front. The truck has two transparent bright orange lights at the top and two sloped transparent bricks for a windshield. It also has two transparent red 1x1 plates at the back that are used as lights, and two transparent yellow sloped 1x1 tiles used as front lights, which are, however, covered by the snowplough. A snowplough (also spelled snowplow, snow plow or snow plough) is a device that can be mounted on a vehicle, used for removing snow and ice from outdoor surfaces, mainly roads. Although this term is often used to refer to the actual vehicle rather than the device that is mounted on it, more accurately these vehicles are known as winter service vehicles, especially in areas that often have large amounts of snow, or in specific environments such as airfields. In other cases, pickup trucks and front end loaders are outfitted with such attachments to fulfill the same purpose. This page was last edited on 9 January 2016, at 12:52.